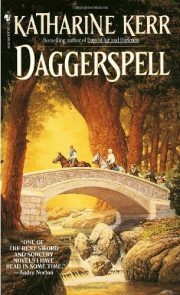 This is the first time I’ve read Kerr’s 1986 debut novel, Daggerspell. One major reason for that is that book distribution in Ontario in the 1980s was unreliable, even for books from major publishers like Del Rey and I never saw a copy to read. Pity, because this is a solid little debut.